AES Shady Point along with OG&E held a Celebration of the People of AES Shady Point. On, Feb 1, 2019, AES Shady Point held a AES Shady Point/OG&E Celebration Lunch at the Donald W Reynolds Center in Poteau. The purpose was to say goodbye to AES Shady Point and welcome OG&E. The reason for the celebration stems back to August 2018, when AES announced, the facility would close after a contract with OG&E was not renewed. Good news emerged when in Dec 2018, OG&E announced that they would be buying AES Shady Point. Poteau Mayor, Jeff Shockley, introduced the distinguished guests in attendance--members of AES, OG&E and state legislators. AES Shady Poiont is a coal-fired plant located eight miles north of Poteau. They held a ground breaking in 1987, with construction beginning in 1988, and officially opened in 1991. The company was the first facility in the United States to produce a food grade carbon dioxide. 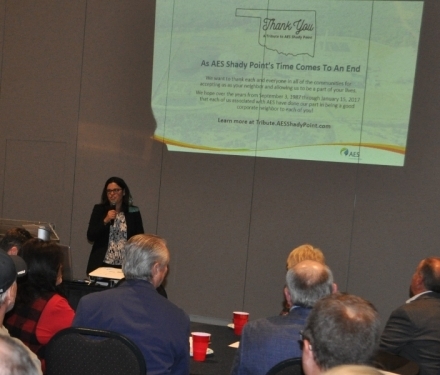 AES has had quite an impact on the local economy by creating more than 1,500 jobs in Oklahoma, both directly and indirectly. AES has always been community and civic minded. Some of the way they have shown this is they supported the LeFlore County District Attorney’s fight against drugs with support of the District 16 Drug Task Force, built the LeFlore County Fair Barn, built Panama Schools, and moved the Poteau Rodeo Arena from Carl Albert State College to the LeFlore County Fair Grounds. AES supported Carl Albert State College with the Beverly McMillian AES Free Enterprise Dorm. In 1992, they were honored with the Power Plant of the Year and in 2008, the State of Oklahoma’s Employer of the Year Award; however, the award they are most proud of is the Reclamation after Mining – American Legion Award. OG&E believes in coal and thinks that the purchase of AES Shady Point is a great addition. The company’s philosophy is the same as AES’s--Community, Safety and Growth. O&GE is Oklahoma’s largest electric utility and has purchased the Shady Point power plant near Poteau. The industry leader with a passion for helping customers, developing members and delivering stockholder value. Safely provide reliable electricity and related services vital to our communities at a reasonable cost. We fulfill our vision, mission, values and beliefs in our actions both at work and at home.